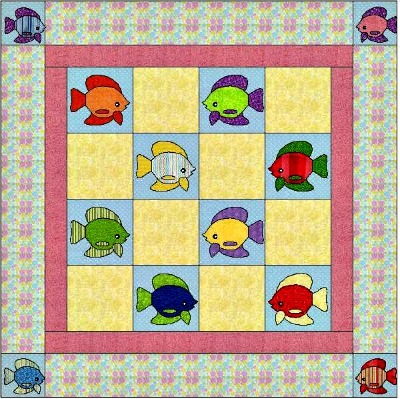 A baby quilt is intended to burst with excitement like our fish quilt pattern does. A rubber duck that swims in the tub or the fish that sits on the shelf will make the baby's eyes glisten with excitement and awakens the baby's imaginary world. 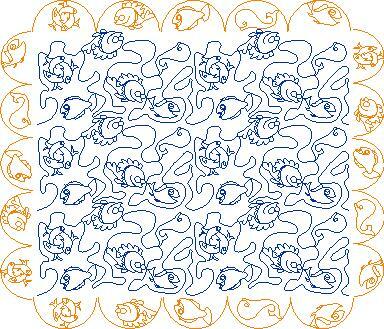 Perfect digitized design for your baby fish quilt! This is a lap size quilt and finishes out approximately 54" x 54". What could be more simple to make and can be done while relaxing from your busy schedule. It is made from 8 center applique blocks and 8 plain blocks which make it very fast to assemble. The borders can be made with 4 corner blocks or without the corner blocks if applique is not your forte…. however, applique is a very forgiving art. To receive access to download the templates for the applique fishes fill in the request form below. This template fits a 9" block and we have an 6" template also for the border cornerstones. For vertical piecing, cut 2 pieces 62-1/2” long by the WOF. Sew the pieces together along the long edges with a 1/2” seam (for backing only). Press seams open. When finished, the backing should measure 62-1/2” X 62-1/2”. You will need an additional 3-1/2 yards of Jumbo Tossed Dots White/Pastel or color of your choice (42” WOF) to cover the back of your quilt. You will need an additional 1/2 yard of Pink Chiffon fabric or color of your choice to bind your finished quilt top. Cut 6 strips 2-1/2” wide by the WOF. Sew the strips together end-to-end with a diagonal seam. Fold binding strip lengthwise with wrong sides together. are available by filling in this request form. 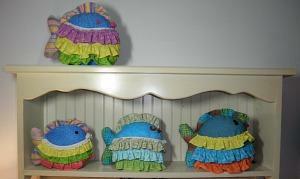 No Fish Quilt would be complete without this stuffed toy to cuddle and hug. If you like our baby fish quilt which was designed especially for a youngster, go ahead and try your hand with this stuffed toy. 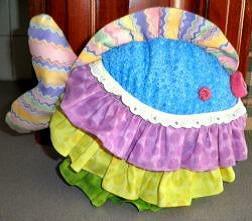 The stuffed animal is designed to be baby's bosom buddy or to be used in the room's decor.